Knowing not only the weight, but also what type of load will be sitting on a wire deck is extremely important. Though all of our stock decks are designed and rated for a “uniformly distributed load” (UDL), we can design a deck to meet just about any type of loading scenario. Below are some of the most common loading scenarios with descriptions and examples of each. While this is a bit of a “perfect world” scenario, this essentially means the load needs to rest over all the support channels and the majority of the deck surface and come within 2 inches of the front and rear load beams. A common misconception in the pallet rack industry is that the load must rest over the beams (front and back) to achieve the full capacity rating. This is not true of an ANSI rated deck. Under ANSI the deck is designed and rated as if the deck was bearing 100% of the load “independent of the support system.” In other words, and ANSI rated deck can support the load independent of the beams. When you purchase rack deck, it’s always best to confirm that your decks are ANSI rated if you intend for them to support a UDL that doesn’t extend over the rack beam. The load must also be evenly distributed within its dimensions. That is, it can’t weigh more in the front than in the rear. 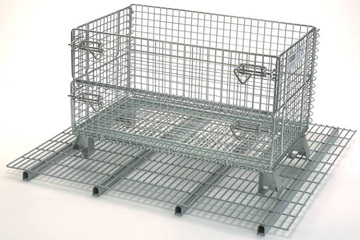 A load that distributes its weight in a concentrated line versus over a uniformly distributed area could cause the wire mesh to carry the entire load and increase the risk of failure. In the photo above, the bulk of the weigh rests on the wire, instead of the channel supports, which can cause the decking to deform, and potentially to fail. Any load which is not uniformly distributed over the entire surface of the decking section. In this case, all of the weight of this pallet is placed in the center of the deck placing the entire load on 2 of the 4 support channels leaving the outer supports untouched. Another common scenario would be a 24” deep pallet load placed in the center of a 48” deep wire deck in a pallet rack bay. When you have multiple pallet sizes stored in the same rack system, the chances of a concentrated load increases. 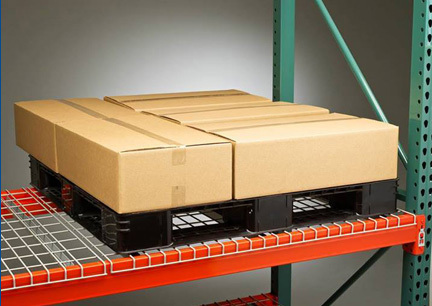 Be sure your forklift drivers and other warehouse workers understand how and where to store smaller pallets. A point load can be defined as any load that has its weight concentrated on individual points versus uniformly distributed. 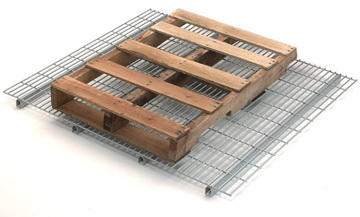 An example would be a 5 point pallet or this container with 4 feet resting on the deck. 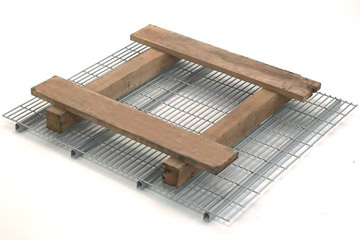 All the points could potentially rest over only wire mesh causing deflection and potentially failure. The weight of the load, or of any potential loads that may be stored on the rack. Whether or not the decking is ANSI certified.